See Designing Custom Forms to learn how to open a form in design view. 1. Look on the form's Tools, Forms menu and choose Publish form or Publish form as. In most cases it won't matter which option you choose, but if you are editing a form, choosing Publish Form is similar to using Save – the original form will be replaced. If this is not your intention, choose Publish form as. It may ask if you want to publish the forms definition. In most cases, no, you don't want to publish the definition. However, others won't see the form unless they have it published or it's in Exchange Server's organizational forms library, unless you include form definitions. 2. Click on the Look in list and find the location where you want to publish the form. 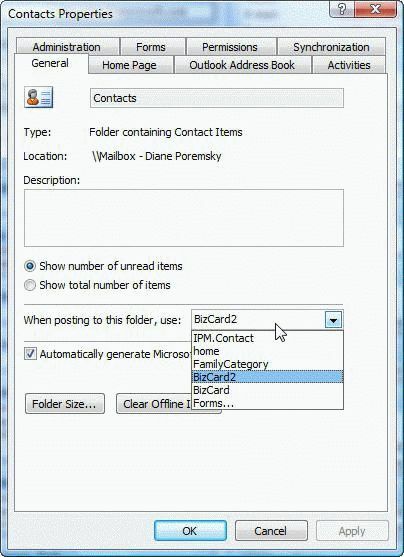 You can use any Outlook folder, the personal library or the Organization library, if you use Exchange server. 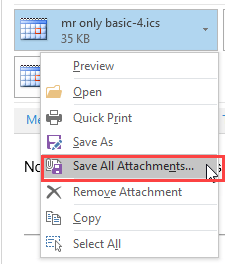 If you choose an Outlook folder you can select that folder's on Actions menu to open the form – published forms are at the bottom of the menu. 3. Type the form name in the Display name and form name fields and press Publish. When you want to use the form, look for the form on the Actions menu when you have the folder you published it to open. If you published it to the personal forms library you'll need to browse to find it using the Tools, forms, Open form menu. You can easily change the default form used for new items for each item type except Mail. Right click on the folder name and choose Properties. Then select the new form from the General Tab, When posting to this folder use: field. Now when you click the New button or otherwise create a new item of that item type, it will use the form you selected. 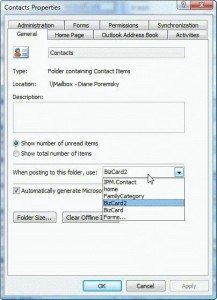 To change the existing messages to use the custom form, the easiest way is with DocMessageClass, a free utility. 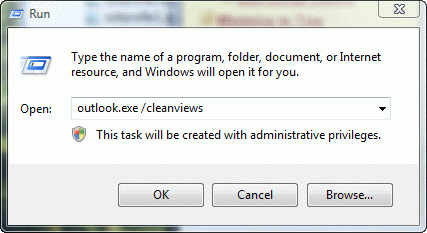 Note: DocMessageClass does not work with Outlook 2013. Published January 6, 2011. Last updated on June 16, 2017. WOW! This was exactly what I needed. Thanks!!! 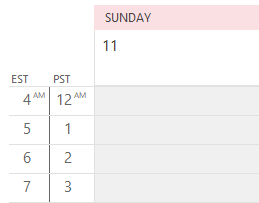 I have tried to create a custom for in Outlook for others to reply using fill in the blank boxes. It doesn't show the custom form boxes I inserted or anything below the normal box for inserting a response. I tried showing the definitions (per an earlier post) but that doesn't bring it up either. I am sure there is a less stressful way to do this. Any ideas? Did you set separate read and compose views? If so, you;ll only see the values in the fields in the fields are in both views. Thanks so much. I just wanted to add a next action field to the existing contact form and your post made it relatively painfree. 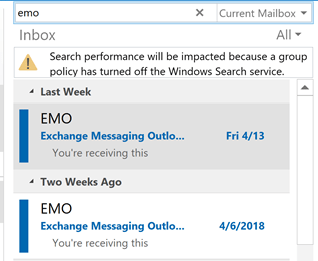 I wonder why MS didn't anticipate that messageclasses would require changing? They anticipated it, but chose not expose it to the average user. 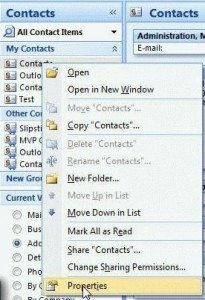 They did this with a lot of things that most users will never use.